Eastman’s gel batteries have a higher life span due to antimony – free alloy. In addition, low electrical resistant and high porosity corrugated silica material improves electrical performance. Currently available in three models – E115G(115Ah), E165G(165Ah) and E225G(225Ah), they have a wide range of applications ranging from emergency lights, communication power supply, office automation equipment, electrical power equipments to solar power plants and water pumps. 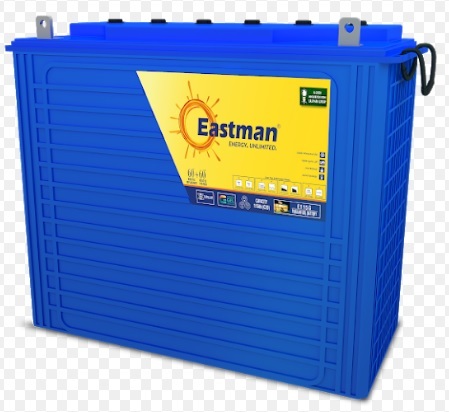 Eastman Auto and Power Limited is revolutionizing the battery industry by incorporating the latest technological advances on various industry parameters. The battery division offers four products – Tubular Gel SMF Batteries, Tubular Flooded Batteries, E-Rickshaw Batteries and Solar Batteries. The manufacturing and R&D center for all four types of batteries take place in Nalagarh, Himachal Pradesh at Eastman’s state-of-the-art manufacturing facility. With the capacity of manufacturing 1 lakh 30 thousand batteries and with various Product Certifications (UL,CE,IEC,MNRE etc). Eastman offers innovative power backup solutions to meet the needs of customers. 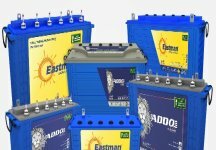 Eastman Auto & Power Limited (EAPL) is the leading manufacturer, supplier and exporter of all kinds of energy storage solutions and solar solutions with manufacturing and research units in India. Headquartered in Gurgaon, EAPL provides the most comprehensive portfolio of customized packages, solutions and services along the solar PV product line for SOHO, Rooftop, Residential and CSR applications. The company also provides batteries for vehicles, Inverters & UPS system applications as well as E-rickshaw and solar solutions. It offers support and maintenance services across the world help to ensure efficient solar and energy storage installations. The range of products offered by Eastman is known for its quality, durability and performance since 2002.